It was mid October when we finished our summer travels around Germany, The Netherlands and Belgium. All things being equal we should have been heading south to get some better weather. But instead we took the ferry back to the UK. Touring the UK has not been a priority for us but this year we seem to have spent a lot of time doing it. In the spring we wanted to get the motorhome up and running and settle in to our new home on wheels. Now here we are in the fall spending a month here for some other obligations. When we bought the motorhome at the end of April it was less than two and a half years since it was first registered in the UK. That means it had never had an MOT. An MOT for our non-UK readers is an annual inspection (MOT = Ministry of Transport). It’s more thorough than anything we had to do with our vehicles for California or Texas regulations. The first MOT has to be done once the vehicle is three years old and annually therafter. Our first task was to get that taken care of. We arrived back in the UK a few days before the MOT due date and opted for a place that we had read about from other blogs to do the deed. Adams Morey were excellent from start to finish, the motorhome passed, with only one note, some of our LED brake lights in our upper rear panel were not illuminating. Given that more than 50% of them still worked, they still passed us. During our month we did several other chores. 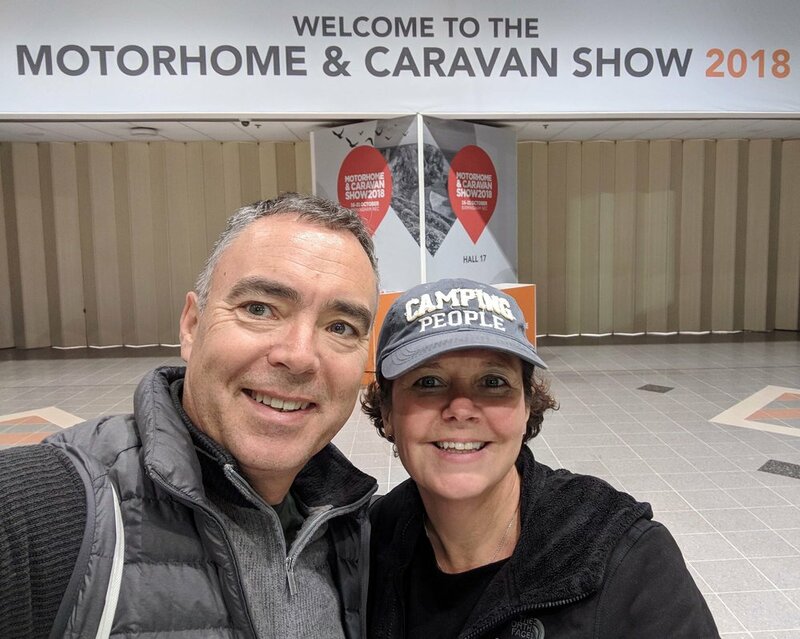 Our first stop was the NEC Motorhome and Caravan show where we easily found all kinds of doodads and essentials that we needed for the motorhome. We bought an extendable ladder to help get access to replace the aforementioned lights, and the light panel itself! We had some central locking issues which Iain fixed with the help of the Carthago UK owners group which is always a font of incredible information. We improved the lighting in our under bed cupboards, with some fab hinge lights we found at the show. We added non-slip strips in the shower as we find it can be like an ice skating rink in there. And we had additional locks fitted to the motorhome to increase our security as we traveled more in Southern Europe. 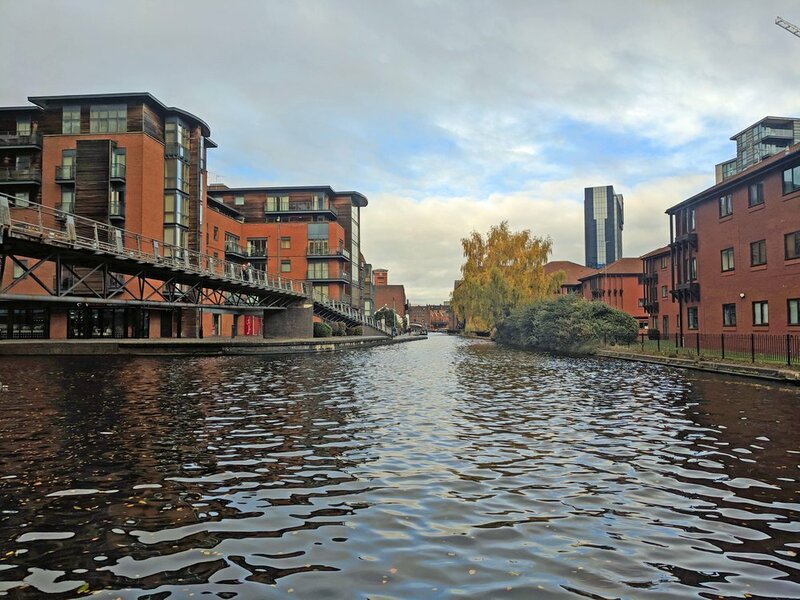 Birmingham: Not known for it’s beauty, but the canals are quite pretty. As well as getting the motorhome ship shape, we had a few personal things to take care of. Iain had a long needed hair cut. Honestly - he was looking like Alan Partridge and no-one was happy about that. We both had to buy outfits for a family wedding we were attending. Iain now owns a suit again - a fact he is non too pleased about. And we both wanted to get our eyes tested as we felt we needed new prescriptions - getting old and all that. We had planned to get our teeth cleaned but found no dentists with availability or a willingness to take us on as one-off patients. We decided we would do it in Spain instead where they are more easy-going about those kinds of things. All of this took up lots of time, but we had plenty of time for fun too. As well as catching up with family we had my nephews wedding to attend in Birmingham, which was a lovely day. We watched Kacey Musgraves in concert in Bristol and we topped it all of with a fabulous few days visiting London, where we both celebrated our birthdays (we have consecutive birthdays!) and went to see the incredible Hamilton in the West End. I’ll do a separate post on visiting London with a motorhome. Wanky new bar in Birmingham that we couldn’t stop sniggering at. All in all, it was a packed month in the UK and we got lots done. We went to some great pubs, had a few tasty curries and all the other typical British activities that we miss from Blighty. But we were totally ready to get out of there by mid November. Knowing that normally we would be much farther south that this at this time of year it was time to start adjusting our latitude. Next destination France and on to Spain.